Cook grits per package instructions until tender. Stir in butter and cheese; set aside. Heat oil in a pan over medium-high heat. Cook sausage about 3 minutes and set aside. Toss shrimp in Cajun seasoning and add to pan. Cook about 2-3 minutes and set aside. Add broth and tomato paste and simmer 3-5 minutes. Add sausage and shrimp, season with salt and pepper to taste. Mix in cream and remove from heat. 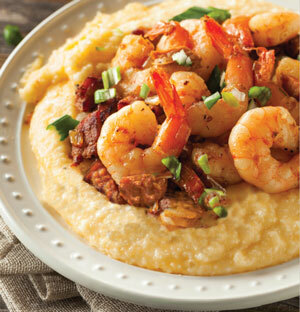 Place grits in individual bowls and top with shrimp and sausage mixture. Garnish with green onions and serve. Makes 4 servings. Published on March 27, 2017 in Entrees.